Showing 45 articles from November 22, 2016. RALEIGH -- The State Board of Elections met through the weekend, trying to figure out a way to bring the Nov. 8 election to a conclusion amid protests filed in half of the state's 100 counties. The only real conclusion they made was that they'd meet again Tuesday (Nov. 22) in an attempt to provide counties with legal guidance on how to handle allegations of voter fraud, including allegations of dead voters and votes cast by active felons. LOUISBURG -- When most folks see a few pieces of split and well-dried red maple and a couple of pieces of dried red spruce, they're probably thinking firewood! But Louisburg's Mike Anderson sees a violin. Or, a fiddle. If the pieces are a little larger, perhaps a cello. Snuggled into a corner of Anderson's Oak Drive backyard is a small, stand-alone workshop where he handcrafts violins or fiddles, smaller pocket fiddles and, a couple of times, a cello. Christmas celebrations will begin in earnest next week. First up is Franklinton, which will host its Christmas Parade -- the county's only nighttime event -- at 7 p.m. on Thursday, Dec. 1. The town of Youngsville will host a day of festivities on Dec. 3, beginning with the Youngsville Rescue Auxiliary Breakfast from 7-9:30 a.m. The parade will follow at 10 a.m.
LOUISBURG -- If Black Friday sales, the relentless pressure of finding just the right gift and the hectic holiday season is about to become too much, one event may be the antidote. A 19th Century Christmas Open House is planned at the historic Person Place home on the corner of the Louisburg College campus at 605 N. Main Street. Slated to run from 5 to 7 p.m. on Friday, Dec. 9, the event is a quiet alternative to the hectic 21st Century Christmas. Amazingly, it's time to talk turkey. And all the fixin's -- and probably a long, long nap for many of our male readers who will be catching a little shut-eye while the female members of the family are planning their annual assault on all things retail. If that sounds sexist, so be it. It's also based on experience -- and examples are easy to find. Don't look now, but Turkey Day is upon us! In just a few hours -- earlier in some homes where cooks prepare food well in advance -- ovens will be heated up, cooktops filled with pots and pans and everyone will be eagerly awaiting the fun, food and fellowship which comes with one of this country's favorite holidays, Thanksgiving. It's a time for families to gather together and enjoy the fruits of their labor and continue a long-standing tradition that dates to our more agrarian roots when the feasts of fall followed a bountiful harves,t period. Trying to cover the twists and turns from this election is tough, particularly on a short week -- I wrote this on Friday morning because of Thanksgiving deadlines. 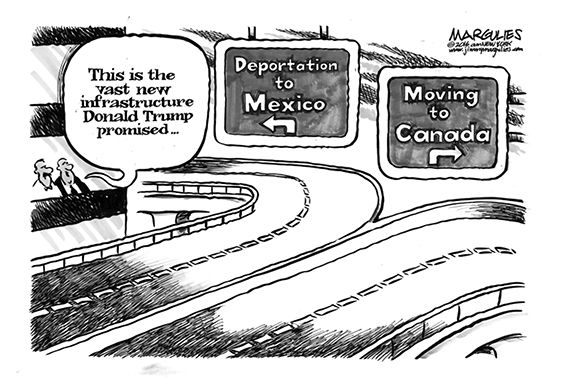 There are a lot of moving parts. It made me think of how Star Trek sci-fi engineer Montgomery Scott described transporting matter from one place to another -- which is traveling beyond the speed of light. Today is Thanksgiving eve in America. It's a holiday that has morphed into a day where the nation takes some time to reflect on all it has to be thankful for between eating and watching football. Like the great nation it is part of, Franklin County has much to be thankful for. Today I wanted to point out a few of our blessings. LOUISBURG--Funeral services for Linwood Perry, 58, who died Sunday, Nov. 20, 2016 will be held Saturday, Nov. 26, at 1 p.m. in the Richardson Funeral Home Chapel in Louisburg. Burial will follow in the Perry's Church cemetery. LOUISBURG - Sue Lovin Smith, 62, died Saturday, Nov. 19, 2016 at her home. The family received friends 6 - 7:30 p.m. Monday at Strickland Funeral Home & Crematory, Louisburg. 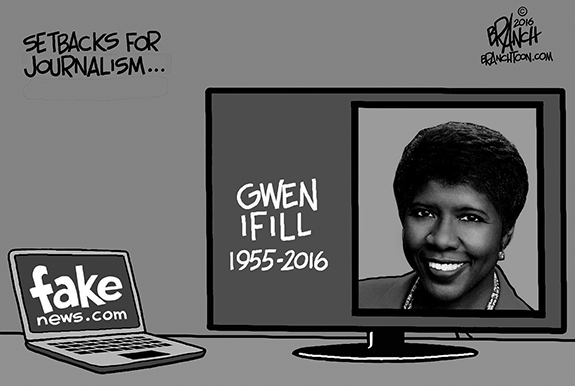 A private memorial service was held. CELIK SHINES ONCE AGAIN. 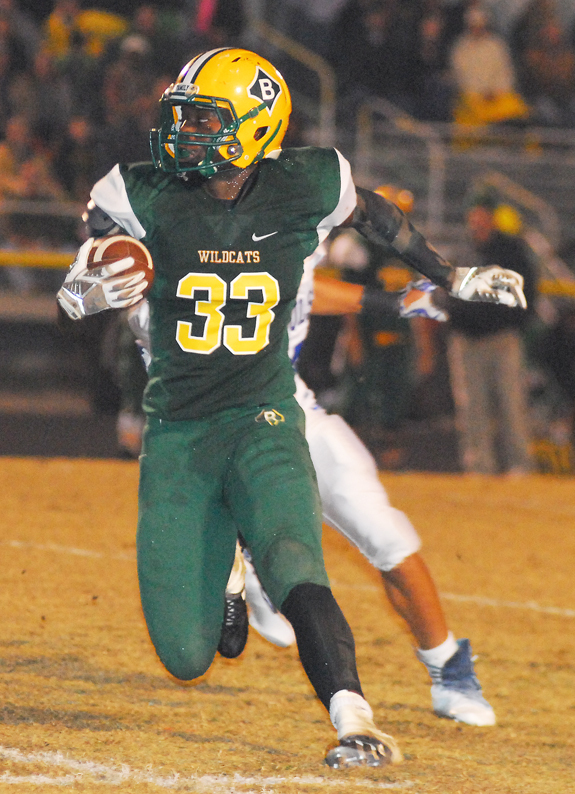 Celik Curtis has been exceptional this season for the Bunn High School football squad. BUNN -- Bunn hosted a pre-game ceremony last Friday to commemorate the illustrious career of retiring head football coach David Howle. But Howle hopes he still has a dose or two of heroics remaining in his tenure as the Wildcats continue to advance through the Class 2-AA State Playoffs. Howle's storybook night won't be his last as Bunn, after a slow start, rolled past St. Pauls by a 49-12 margin. The second-seeded Wildcats, now 11-1 overall, will move into a second-round event this Friday at home versus Northside-Jacksonville, which was a winner at Randleman. SCORING WHIZ AT BHS. 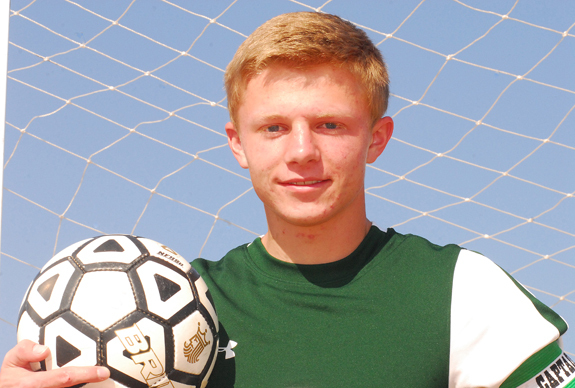 Senior forward Brian Husinko delivered 49 goals this season for the Bunn Wildcats and has been selected as the Northern Carolina Conference Boys Soccer Offensive Player of the Year. BUNN - Four years ago, Charles Haley took over as the head boys soccer coach and Haley faced an immediate communication problem. Bunn had too many players with the first name of 'Brian' on its roster, so Brian Husinko simply became known as 'Husinko' -- and that would stick for the rest of his career. And what a career it would be as Husinko developed into a dominant performer, especially during his senior year, when he made a name for himself in the area soccer circles. 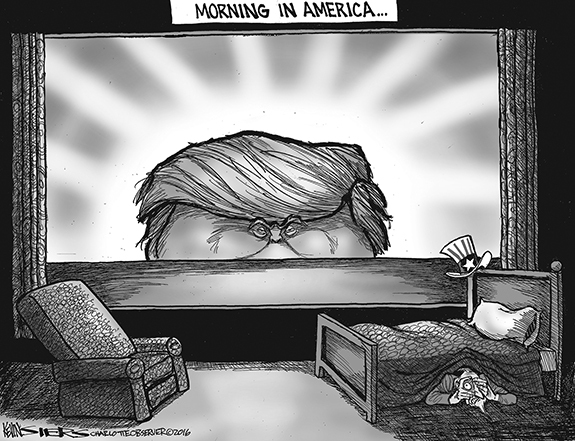 BRACING FOR IMPACT. Louisburg High School's Tyree Davis (with ball) is tackled during a kickoff return during last Friday's home contest against Gates County in the first round of the Class 1-AA State Football Playoffs at Patterson Field. LOUISBURG -- Following a successful regular season, Louisburg High School was able to secure a home game in the first round of the Class 1-AA State Football Playoffs. That didn't mean, however, that the contest would be easy as Gates County brought a solid club to Patterson Field last Friday -- and left with a 34-17 decision over the Warriors. BLOCKED PATH. Bunn High School's Selena Cooke tries to drive past a Southern Nash defender during last Thursday night's girls basketball game at the Bunn Dome. 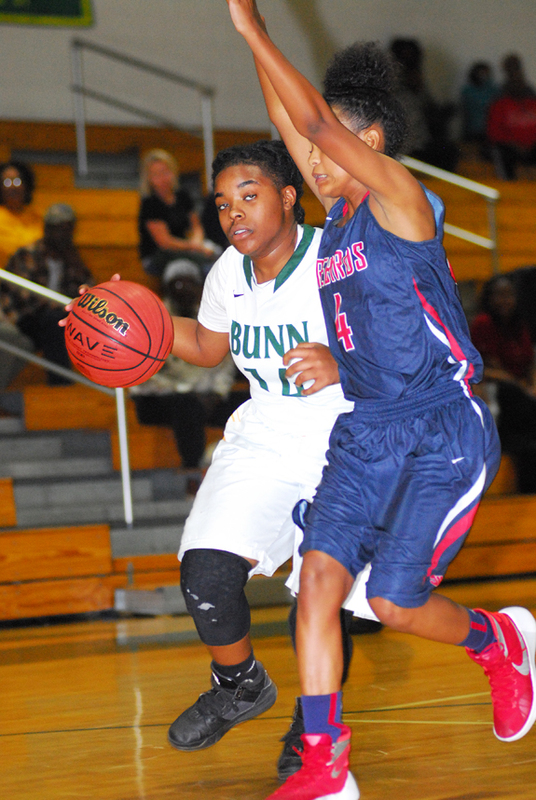 BUNN -- With point guard Bernadette Cooke out until later in the season and post Cressida Duncan moved back to Kentucky -- and several other key players graduated -- the Bunn Ladycats are short on experience but high on potential during the 2016-17 basketball campaign. Bunn opened its season in short-handed fashion last Thursday against backyard rival Southern Nash. 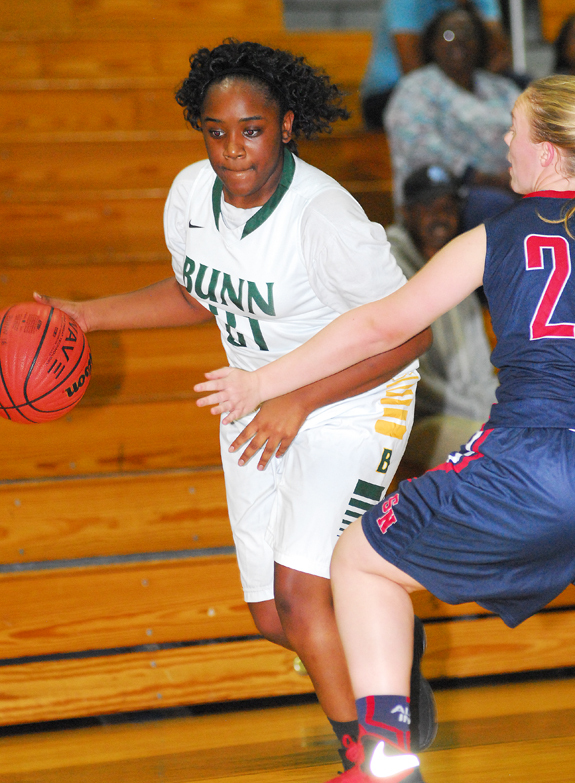 The Ladycats showed their inexperience -- but also displayed some promise for the future -- during their 31-29 home loss to Southern at the Bunn Dome in a back-and-forth game. 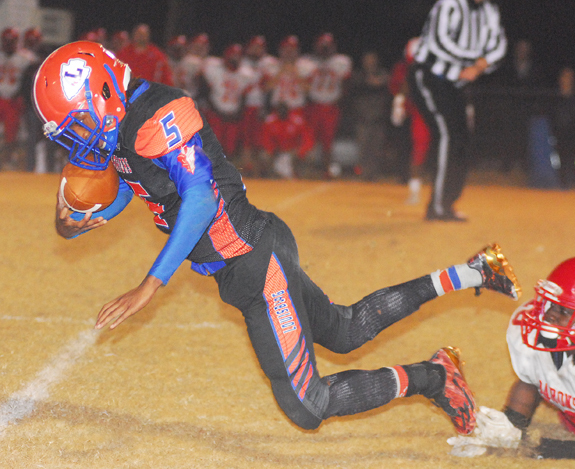 AHOSKIE -- A tough first-round draw awaited the visiting Franklinton Red Rams in their final football season -- at least for the near future -- on the Class 2-AA level. 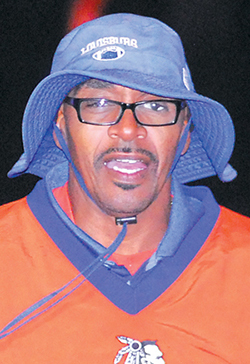 That campaign would close last Friday night as the Red Rams were defeated 46-18 by a strong, high-powered Hertford County contingent. Franklinton, which entered as the No. 6 seed, fell behind 20-3 after one period of action. MANNING THE POINT. West Virginia native Garret McCarty (with ball) distributes the ball from his point guard position during last Saturday's home basketball victory against Thomas Nelson CC. 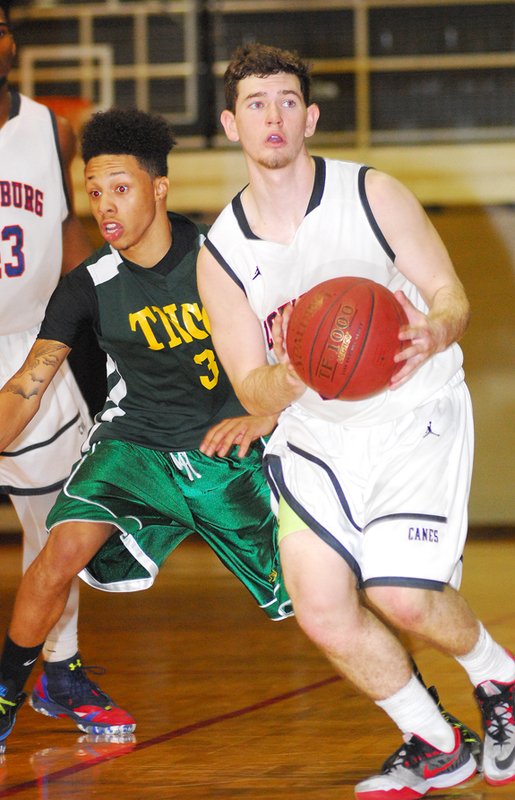 LOUISBURG -- Louisburg College's list of returning starters from last year's men's basketball team was a big zero. So LC head coach Neil Dixon is literally starting all over again with no players back -- but he expects the program to quickly reload and once again be a factor in the Region X standings. 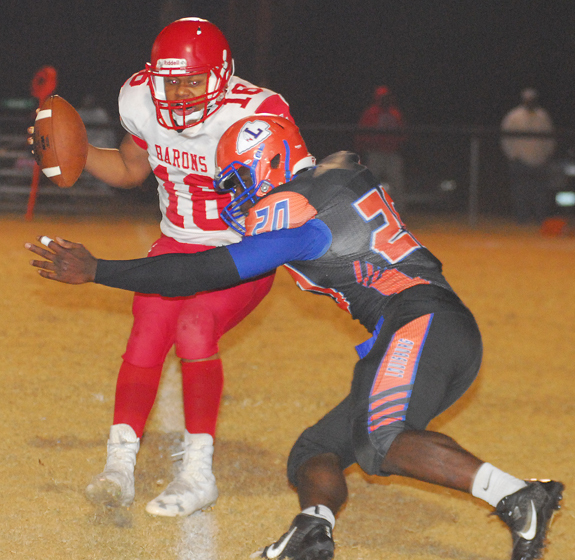 LOUISBURG -- Louisburg College's football team ended its season with an undefeated mark. The Hurricanes beat nine teams - the best record in 11 years of competing. The young men who brought home the wins are rightfully proud of their accomplishments. They were honored during Louisburg College's basketball game Nov. 21. VIRGINIA BEACH, Va. -- Adrian Moore poured in 30 points and Justin Tankelewicz added 22 to lead their North Carolina Wesleyan College basketball team to a 90-71 win over Frostburg State last Saturday in the 2016 Marlin Tip-Off Tournament hosted by Virginia Wesleyan. Moore, who had previously scored 29 points in Friday's opener, was named to the All-Tournament team for his efforts. Versus FSU, the Bishops used a 22-6 run midway the first half to forge a 55-30 halftime advantage. THAT'S A BIG BASS! 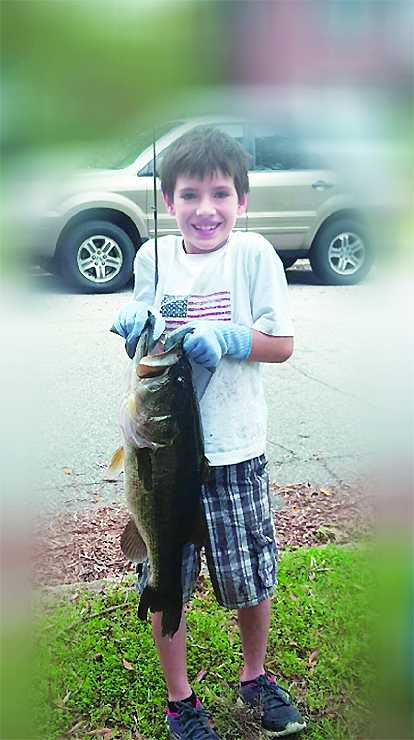 Riley Burton of Franklin County caught and released this 8-pound, 2-ounce large mouth bass on his Zebco 202 last month while fishing in a private local pond with his grandfather, Hudson Burton. 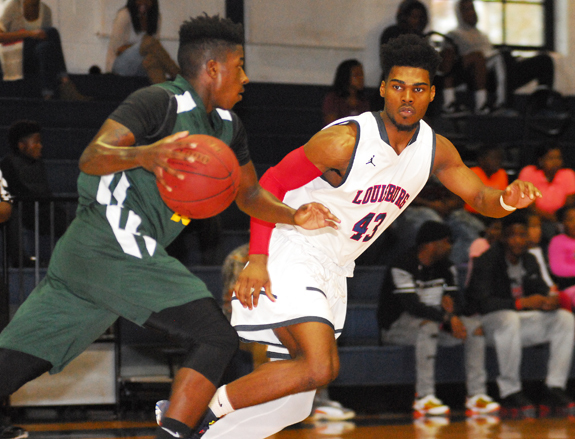 Louisburg College's Jordan Oakley (right) plays tight defense in the backcourt during last Saturday afternoon's home hoops victory over Thomas Nelson Community College. Louisburg's Terry Allen (right) registers a quarterback sack during last Friday night's home playoff setback against the Gates County Red Barons. Makayla Strickland (with ball) is one of several new faces this season for the Bunn High School girls basketball squad under Coach Matt Keith. 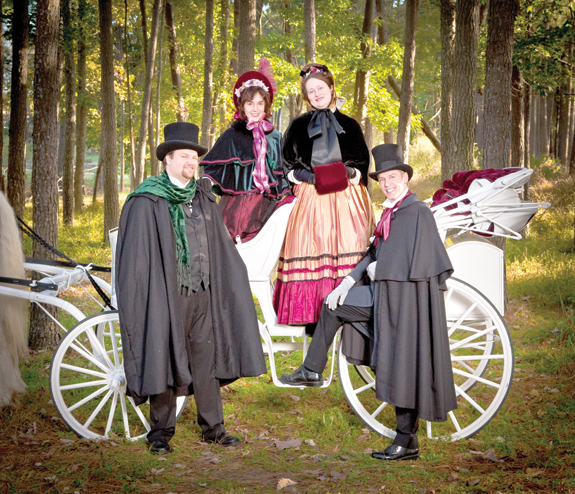 "The Best Christmas Pageant Ever" will return to Louisburg Collect Dec. 1 to 11. Norris Theatre Director Wally Hurst will direct the production, which was written by Barbara Robinson. In this Christmas tale, a couple struggling to put on a church Christmas pageant is faced with casting the Herdman kids - probably the most inventively awful kids in history, Hurst said. 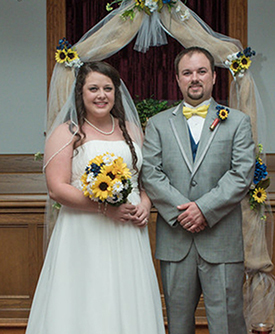 Allison Kaye Fobes and James Furman Wright Jr. were married on Saturday, Oct. 8, 2016 during a 4 p.m. ceremony at Duke Memorial Baptist Church. The officiating minister was Tony Gupton. The bride is the daughter of Rodney and Lisa Fobes of Castalia. The groom's parents are Lisa Neville of Louisburg and the late James Wright Sr. of Henderson. Mike Anderson was busy talking with visitors at the Village of Yesteryear at the North Carolina State Fair this year when a man invited him to come outside the exhibit area and listen to a musical group perform on a nearby stage. 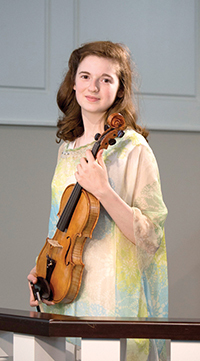 Playing the violin -- or fiddle, if you prefer -- was Katelyn Martin of Durham who had won a free instrument from Anderson a year ago. Anderson said he recalls enjoying the music when Katelyn stopped between songs to point him out to the crowd, thanking him for his generosity and acknowledging his skill as an instrument maker! HENDERSON -- The Vance-Granville Community Band will perform traditional Christmas fare as well as light classical and contemporary favorites during its ninth annual holiday concert on Monday, Dec. 5, at 7:30 p.m. at McGregor Hall Performing Arts Center in Henderson. The band is led by Louisburg resident Brian Miller. 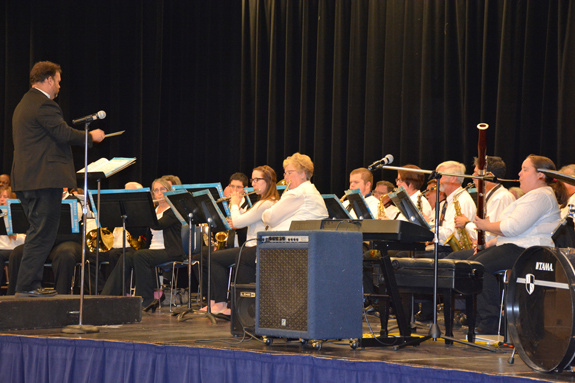 This will be the first time that the Community Band has held a concert at the 1,000-seat venue, which opened earlier this year and is located at 201 Breckenridge Street in downtown Henderson. Admission is free. In August 1890, 15 years after the town of Youngsville was incorporated, its commissioners adopted a set of local ordinances. Similar to those used in Franklinton and Louisburg, the ordinances reflect varied aspects of life in a simpler era, when animals pulled wagons and motor vehicles were rare. The first few rules demonstrate the importance of animals to the local economy. It was unlawful "for any live stock to run at large within the corporate limits of the town, to be ridden, driven or fed upon the sidewalks, nor hitched to the trees, pailings [sic] or fences on the sidewalks under penalty of one dollar for each offence." Louisburg College: America's Premier Private Two Year College. Yes, "premier" for many students who have come and gone from an institution that has changed their lives forever. At the "Happily Ever After" reunion, which took place Oct. 29 (Homecoming), the memories were flying everywhere, and the recollections of good times and happiness were obvious for those present (about 100 of them); five Alumni Awards were given, and LC won the football game. Franklin County 4-H'ers were busy this fall as they prepared their crafts, produce, poultry, and livestock for the 2016 NC State Fair. Franklin County had an overwhelming 73 youth participate in the State Fair this year. There were 31 youth who entered items in crafts and 38 kids that showed livestock. Some of the categories that these youth showed or entered items into included but are not limited to: livestock (cows, goats, sheep, and hogs), poultry, crafts in the 4-H division and other divisions, culinary, produce and canned items. LOUISBURG -- Each year, the United Way supports education in Franklin County Schools through the organization's teacher grants program. The program encourages classroom teachers and school faculty to apply for up to $1,500 to support innovative classroom projects or school-wide programs that will impact student learning in positive and engaging ways. For the 2016-17 school year, Franklin County Schools in partnership with the United Way of Franklin County is pleased to announce that 13 FCS teachers will be receiving more than $12,000 in funding this year. 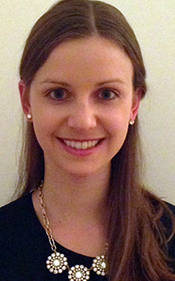 LOUISBURG -- The Trustees of the Alston-Pleasants Post-Graduate Scholars Fund announced that Allison Blackburn has received a Scholarship Award to support her post-graduate studies at the Medical University of South Carolina in Charleston. Blackburn is a member of the Occupational Therapy Class of 2018 at the Medical University of South Carolina, and was recently elected President of her OT class. "I am honored to serve in a leadership position, and am looking forward to serving my classmates and professors," Blackburn said. 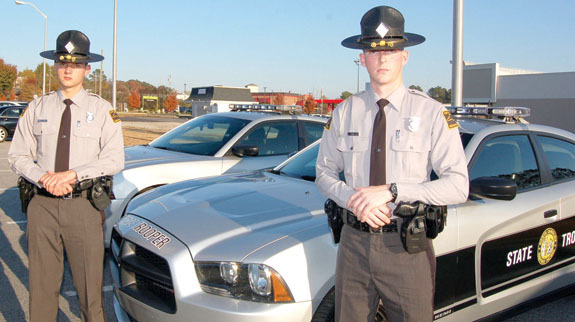 CARY -- Two Franklin County residents and firefighters graduated last week as part of the State Highway Patrol's 140th Basic School. Trooper J.T. Southerland and C.R. Lanham were two of the 47 cadets who completed the 15 week academy, enduring training in physical fitness, defensive tactics, drivers training, as well as other sessions of motor vehicle laws. Their graduation was held Nov. 18 at Colonial Baptist Church. FRANKLINTON -- Life can get in the way, even for the closest of family and friends. Three years ago, the men of the Green and Cooke families sought to rectify that and started meeting, figuring out a way they could get together more often to hang out and catch up -- eventually sowing the seeds for a once-a-year getaway for the group. "We'd get together and we'd hang out and laugh and joke and enjoy time together," said Tim Green, president of the group, which became the Green-Cooke Men's Group. YOUNGSVILLE -- Franklin County sheriff's deputies are looking for a suspect who robbed a sweepstakes business at gunpoint. According to authorities, a man entered the sweepstakes cafe located at 225 Weathers Street just outside the town limits just after 9 a.m. on Nov. 20. The man pointed a nickel-plated long-barrel pistol at a store clerk and demanded money. There was one other person inside the business, according to Franklin County Sheriff's Office Chief of Staff Terry Wright, but no shots were fired and no one was injured. YOUNGSVILLE -- Police arrested a Louisburg man they allege ran from a police checkpoint. According to a report by Youngsville Police Lt. M. Little, he was conducting a license checkpoint when someone, later identified as Charles Wright, 41, pulled up in a burgundy Kia Sportage sport utility vehicle. Wright, according to authorities, approached the checkpoint, he almost drove off the road to the left, nearly hitting a parked patrol vehicle, before stopping. Litter? Not if the gitters git it! 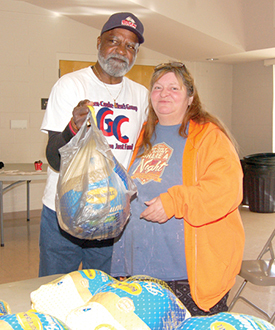 In April 2013, a small group formed in the Moulton Road community to pick up litter. The group picks up litter on a two-mile stretch of Moulton Road near the convenience site on Saturday mornings every six to eight weeks. The group has picked up 21 times the past three years, with on average four to 10 volunteers who pick up 10 bags of litter each time - half of which is recyclable materials. FRANKLINTON -- The town's board of commissioners approved two special use permits to add to the town's housing options. First, Michael Hurt proposed converting a single family dwelling at 312 Bowen Street into a duplex. His brother, Mason Hurt, proposed doing the same at 304 Bullock Street. "I know that there is a need for it," Michael Hurt said. "I feel it will benefit the community and increase property values. FRANKLNTON -- A collapsed sewer main caused sewage to spill from the Franklin County system last week. According to county staff, a terra cotta clay sewer pipe, which had been partially encased in concrete, collapsed on Nov. 15. As a result, about 2,000 gallons of sewage from an eight-inch sewer main on Taylor Street spilled. Franklin County Public Utilities staff investigated the matter and later that day, they found the source of the issue and made repairs. Mionnie's Place, located in downtown Louisburg, 203 Court St., recently held its grand opening and ribbon cutting sponsored by the Greater Franklin County Chamber of Commerce. 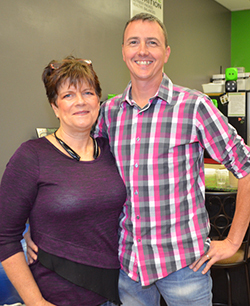 Open since Oct. 24, Mionnie's is a nutrition club offering a healthy alternative to fast food. The healthy meal and snack options include protein smoothies, green tea, aloe water, protein bars, soy nuts and more. In addition, Mionnie's offers free community workouts including a cardio drumming program and fit camp. With the snip of a ribbon last Thursday evening, Fresenius Kidney Care's new Louisburg facility opened its doors to the community. The facility, which is located at 935 North Main Street, is not quite ready for patients but will be shortly as soon as it passes its final inspection by the state, officials said. 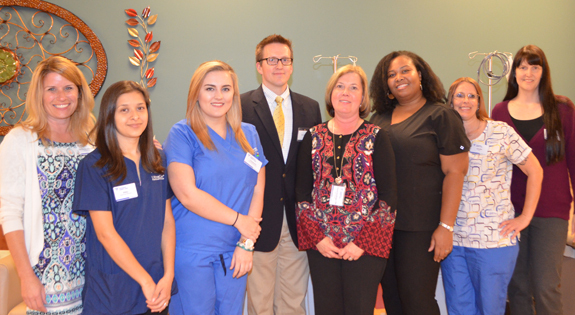 Fresenius Kidney Care, the dialysis division of Fresenius Medical Care North America and the nation's leading network of dialysis facilities, invited the community to an Open House celebration on Thursday, Nov. 17.